Agent Dash 2.0: Should you really upgrade just yet? I’m a huge fan of Agent Dash. It’s a “Temple Run” type game in which all you ever do is swipe left, right, up or down. The graphics are insanely good and it’s a very addictive little time killer. 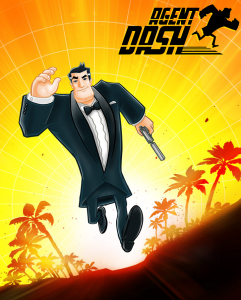 As Agent Dash (or any of the other characters) you run through tricky levels, collect diamonds, shoot at enemy technology and avoid obstacles. That’s it. When the new update came along a couple of weeks ago it promised many good things. But what I’ve found is that many of the changes have an impact on the game dynamic that we have come to love. Currently players are heavily coerced into upgrading – but before you do, let me tell you what has changed in Agent Dash. If you don’t like it, you can always restore your game from a backup and wait until these little niggles have been fixed (if they ever will). 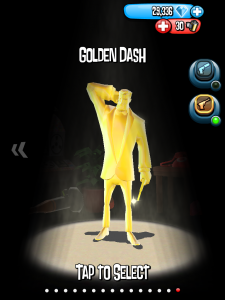 What makes this game so addictive are all those little bits that make up the Agent Dash Dynamic: jet packs, slow-mo tokens, air drop, golden gun, silenced gun, a diamond attraction magnet, several funky characters in funky outfits – elements that feed into a greater story. The Dash Universe. The new version has changed how these things can be obtained and how they can be used. 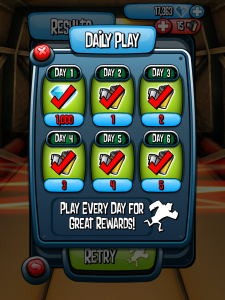 In Agent Dash you collect diamonds on your runs – these were previously the main currency in the game. With those you could upgrade your gadgets to become better and more powerful. Before the upgrade these would randomly appear in the game and could be used if you grabbed them. Let me give you an example: You’d run along the jungle, there appears a jet pack, you jump up to get it and fly off for several seconds, collecting every diamond on your way while avoiding obstacles. The more you had upgraded the jet pack, the longer it would let you fly. Magic! Most gadgets were upgradable in stages. As you collected diamonds, you could pay with those for an upgrade and make your gadget better or last longer (like the jet pack). After 4 upgrades you’re maxed out, and as you can image those upgrades were expensive – which in turn enticed you to play more. That was all there was to it really. If you’re an avid gamer, there was never a need to pay real cash for any in-game element, unless you wanted to. For example, if you didn’t have the patience to collect 80.000 diamonds to buy Jawbone you could just purchase diamonds in-app for real cash. Until now this was the only source of income for the developers. But when you’ve played the game like a lunatic for several months I guess there came the point where you had collected so many diamonds that you owned all the purchasable characters and all your gadgets were maxed out. For me that was the time when I stopped playing Agent Dash as regularly as before, because other than the factor of “a couple of minutes of fun” there was nothing else to obtain. Undoubtedly I wasn’t alone when the Dash Addiction left me, which was probably showing up on some usage statistic at Full Fat in Warwick, where the game is made. I’m a developer myself so I do understand that you have to make money with your creations – so I guess if not enough people are buying your in-app diamonds, you’ll have to look into other streams of revenue from the game. 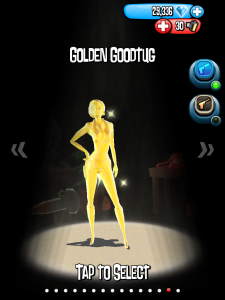 Full Fat did just that with a small upgrade a while back: they introduced “Gold Versions” of the two main protagonists Agent Dash and Agent Goodtug. Each shiny new character could no longer be obtained with diamonds, but instead had to be bought with real cash – 99c or 69p, Apple’s Level 1 price tier. This was of course a completely voluntary expense for gamers, so if you didn’t want to you didn’t have to buy them. You still had 10 other characters to play with. It had however changed a completely free game, in which you could obtain every available item by sheer persistence, to something that – if you wanted everything – you now had to pay for, albeit a nominal amount. It wasn’t like this before. I remember feeling just a tiny bit cheated by this subtle introduction. Agent Dash – Pure Gold! With the upgrade also came a “nag screen”: before each run you were reminded that you should really be spending diamonds on “disposable stuff” (it’s a bit like what a bank does when you have too much cash sitting in your current account). So the goldies were hanging in there, and we kept playing every so often, slightly annoyed by the nag screen, but really with no intention to ever spend some money. It just wasn’t necessary to enjoy the game. This must have also shown up on some usage statistic in Warwick, and upon this being “not profitable enough”, Full Fat changed the game again – this time a bit more drastically to the version we now call 2.0. The biggest change is that diamonds are no longer the main currency in Agent Dash. It’s a bit like what happened to the US Dollar when it was downgraded. It hurts! You can still collect diamonds as you did before, but what you can buy with them is now restricted to the use of disposable items such as jet packs and magnets. Characters for example can no longer be obtained by saving up diamonds. Instead, you must buy them with a new scary currency called “microfilms”. Even though from a spy point of view microfilms are a funny addition, they cannot be collected for free. The only way to get microfilms is to purchase them in-app with real cash. Let me give you an idea of prices here: you can buy The Queen character for 150 microfilms. But buying 100 microfilms will cost you £4.99, or 350 microfilms will cost you £13.99 (read: expensive). When the upgrade first came out there was a “daily play” bonus which would give you some microfilms for free if you played every day. I got my count up to 30, but these bonuses have since stopped. It is at the discretion of Full Fat if and when these bonuses come along, and you cannot rely on them. I haven’t found any other way yet to collect microfilms in the game. As it stands, your own hard cash is the only reliable way to obtain them. The implication of this new scheme is that characters ultimately cost you hard cash, because you have to buy them with microfilms now. Note that if you haven’t yet bought characters like Bobajob, Jawbone, or any of the Dash/Goodtug outfit variations, after the upgrade you can no longer buy them with diamonds! You will now have to fork out microfilms instead. The same goes for the Gold Characters and Dr Quantumfinger: you can still buy them for 69p/99c in the old version, but with the upgrade they will cost you microfilms too – which is considerably more expensive than a tier 1 price tag. Bottom line: if you want any of those characters, buy them BEFORE you upgrade. There is no going back! At the end of each run, after you’ve run into that sign or fallen off the bridge, you were previously presented with the option to “continue” for a sum of diamonds. You could do this as long as you had diamonds, even though the price tag got steeper the more you continued. With the upgrade, this procedure has been replaced with microfilms too: You want to continue? Pay with one microfilm. If you’re relying on this feature you’re in for a nasty surprise. Jet Packs, magnets, slow-mo, cloak and all the other funky gadgets need to be bought before a run, for a sum of diamonds. They no longer randomly appear several times throughout a run. If you don’t buy any of these, they won’t appear – and all the upgrades you’ve been purchasing in the past won’t matter anymore. A magnet will now cost you 500 diamonds per run. When you’re done, you have to buy another one – unless you stock pile them. Every so often you will end up running with no magnets appearing because you didn’t buy them or have run out. The same goes for the slow-mo and the new cloak option for 750 diamonds per pop, but those have always been upfront purchases. Previously the jet pack would show up several times throughout a run to give you a breather from all that running. It’s still around, but it’s usage has changed. In the upgrade you have to purchase a jetpack upfront for 500 diamonds. But instead of appearing randomly while you’re on a run, you can now double-tap the screen to use it at any time you like. You can even buy more than one and stock pile them for as many diamonds as you have. This is a great feature that puts you in charge of when you want to use a jet pack. The downside of course is that it is now possible to accidentally use the jet pack when you really don’t need it. For example, if you’re tapping away while shooting that enemy base to pieces, the app often interprets your taps as “doubles” just before the bridge appears, activating the jet pack. Annoying probably best describers this feature. This little puppy appeared randomly on your runs, and when you grabbed it you got a whopping 250 diamonds when fully upgraded (something which has cost gamers a LOT of diamonds beforehand). Say goodbye to your little yellow gem friend – it no longer exists. Really what FullFat are saying is “we don’t want you to have that many diamonds anymore”. Which ties in nicely with the next omission. Remember that very expensive diamond rush option? It would replace your white diamonds with red and blue gems from the very first level, giving you a score and diamond boost when you collect them. Without this upgrade, red coloured gems would show up from level 3 onwards (the town) and would be joined by blue gems from the second jungle (level 5). For a whopping 10.000 diamonds however you could have those bonuses right from the start. Well, that entire “diamond rush” thing is gone for good in the new version. You still encounter red gems starting in the town level (that’s the new level 5), and probably blue ones at a later stage – but I never got that far in the new version. 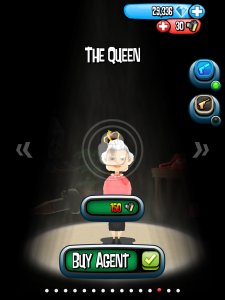 Looks like Full Fat have made some changes which affect the old version as well as the new version of Agent Dash: Some characters can now be bought for diamonds in the new version. At the same time, characters have received a hefty price increase in the old version and now cost you 20x as much as before! Bobajob for example used to cost 40.000 diamonds, but since yesterday he’s a whopping 800.000 in the old version. That’s ludicrous! 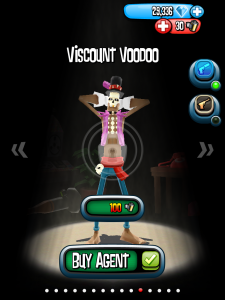 However he can now be bought for 50.000 diamonds in the new version – which wasn’t possible before (he used to cost microfilms). Groovy Outfit Dash can now be bought for 10.000 diamonds in the new; in the old version his price tag has changed to 400.000 (used to be 10.000). Boosts have also gone up a tad: Gem Rush is now 20.000, Slow Mo is 5000 and Air Drop sets you back 8000 in the old version. Streak Discount Savings still appear, but no discount is applied anymore. In a nutshell: Full Fat are desperate for us all to upgrade. They really don’t want you to play the old version anymore. Perhaps there’s something more at stake here than a harmless little video game which (used to) bring so much joy to the many masses. Full Fat have pulled another stunt to render Agent Dash 1.x less useful: they’ve disallowed the Facebook login on the old version, which means that you cannot collect diamonds and use them in the new version anymore. Facebook acts as a “cloud” which keeps your diamond count on all devices in sync. With that gone, there really is no going back and forth anymore. Please how do earn the diamonds. It’s not add to amount of diamonds you get in d upgrade.